AAPL set yet another all-time closing high of 232.39 today, March 29, which is a good way to start the week, sheesh. AAPL is up +0.65% for the week, up +13.57% for the month, up +10.28% for the year, and up +179.62% since the March 9, 2009 market bottom. AAPL exceeded the recent all-time closing highs of Friday (March 26) of 230.90, Wednesday (March 24) of 229.37, Tuesday (March 23) 228.36, and Friday (March 12) of 226.60, to name a few. An intermediate-term buy/long/bull signal was generated on Friday, March 12. Previously, an intermediate-term buy/long/bull signal occurred in mid February 2009 and the race was on - until a sell/short signal just before Christmas 2009. It was a amazing bull run! Another breakout, and buy/long signal, occurred a couple of weeks later, which lasted until February 17. The iPad hype is reaching a fever pitch, lol. The Big Day is Saturday, April 3 when iPad goes on sale. Estimated 2010 sales of iPad range from 3 million units to 10 million units. It has been suggested that iPad sales might cut into iPhone sales some, but I don't believe this will have a material effect. Apple's market capitalization, $210.73B, is now apparently just $50 billion below Microsoft's, $259.61B, per this report. As I noted in the previous post, Phillip Elmer-DeWitt (Apple 2.0 blog) reported today that "Apple Executives Sell 1 Million Shares Of Stock". Seven officers sold 1 million AAPL shares on Wednesday and Thursday of this week at prices of either 229.37 or 230.70. Based on the current all-time closing high, this insider selling through yesterday has not had any stock price effect. AAPL's 50 day moving average is just over 23 million shares traded. At this time I don't see any negative implications to this insider selling. The stock was granted to all seven of them on December 14, 2005 and they became fully vested on Wednesday. Thereupon they sold the stock immediately at AAPL's all-time high trading range and some was reportedly sold for tax purposes. Below is the AAPL daily chart from December 2009, including the December 7 close of 188.95 up through today's all-time closing high of 232.39. AAPL: All-Time High Yet Again! The uptrend line, a rate of price ascent, is from the January 20, 2009 closing low of 78.20 up through the February 4, 2010 closing low of 192.05. The February 4 closing low was the bottom of the 2010 pullback. AAPL battled this uptrend line for days before breaking out above February 25. AAPL has now stayed well above this uptrend line. 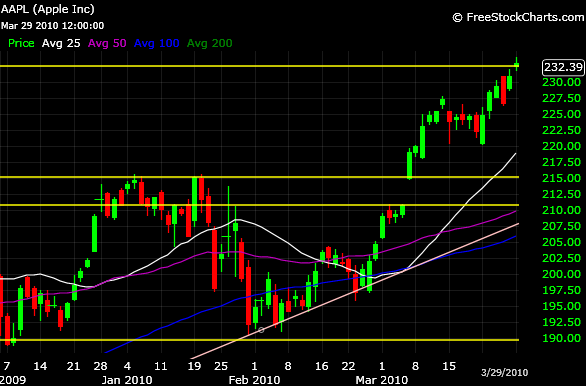 How high can AAPL run until another consolidation and/or pullback? RSIs are not unreasonably high. There is still some upside left in the RSIs, but how long can this bull run last? AAPL continues onwards and upwards powered by the imminent introduction of the iPad (April 3) plus overall sales going strong. The February 4, 2010 YTD closing low of 192.05 was the bottom of the 2010 pullback. The current price is at an all-time closing high. The RSI 14 day and 28 day indicate AAPL is not unreasonably overbought. Additional consolidation and perhaps more pullback is probable before another surge upwards in 2010. I stated previously that I thought the shorts, the Bears, would jump on AAPL at some point due to the inevitability of a pullback, but so far the Bulls just keep charging ahead. The buyers have been in control. The intermediate-term trend became bullish on Friday, March 12. The long-term trend remains bullish.